Belmondo is a cozy cocktail and snack bar not far from the center of the city. This is the perfect place for an after work drink or an evening out with friends. The cozy design generates a nice feeling and you will want to order that cocktail or spirit to match the mood. The decor is vintage and there’s a classy mix of old second-hand furniture that gives the place a particular charming outlook. And those magical bookshelves and old record players… You will find some leather sofas too, perfect to gather with your friends a-la ‘central perk’- style (Friends fans will get the reference). 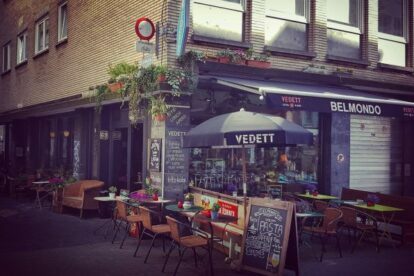 Belmondo is located near the center of the city, on a side street of the center’s main square, Groenplaats. What strikes you as a visitor, as soon as you enter, is the mixed, international clientèle of this bar. International students, ex-pats but also locals seem to prefer this place. It is run by an Argentinian family which gives Belmondo a hint of a Latin feeling too. I like this place because it is bubbly, with an easy-going allure and a warm atmosphere. Next to different cocktails, you’ll find some spirits, but also delicious tapas, snacks, salads, homemade pasta and milanesas. Sometimes they organize live dance and music performances. Check out their facebook page to know when.